Summon: Double the wielder's power and health. 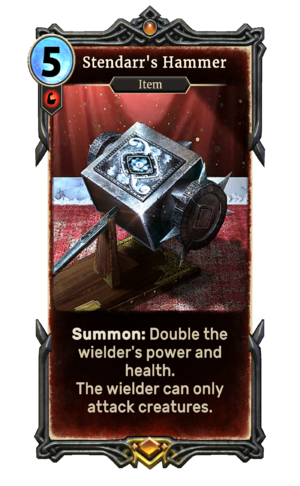 Stendarr's Hammer is a unique legendary Strength item card. It is part of the Houses of Morrowind expansion. Stendarr's Hammer first appeared in Tribunal, and also appeared in Skyrim through its eponymous Creation from the Creation Club.